CALCUTTA, July 24  Indias hopes of grabbing a slot in the Sydney Olympic soccer event went up in smoke when they drew their home match goalless against Thailand in the Asia group nine Pre-Olympic Soccer Tournament at Salt Lake Stadium here today. ISLAMABAD, July 24  Ehtesab (accountability) Bureau of Pakistan today ordered framing of charges against its cricket captain Wasim Akram and seven others for match-fixing and betting. LONDON, July 24  England lost captain Nasser Hussain with a fractured finger as New Zealand pressed for a first-ever victory at the Lords on the third day of the second Test today. WINNIPEG, July 24  Canadas gold-medal winning women came back for more yesterday as the host country claimed another two canoe-kayak victories on Lake Minnesdosa and continued their strong showing on the first official day of the 13th Pan American Games. NEW DELHI, July 24  A new penalty corner routine, brought in as trial rule by the Federation International de Hockey (FIH) and aimed at more open play could help India overcome their perennial weakness in such set-piece conversions. Will AITA harness doubles potential? CHANDIGARH, July 24  The recent grand slam victories in mens doubles event by Indias Leander Paes and Mahesh Bhupathy may go a long way in inspiring the younger lot in India for, it has set a new trend in the Indian tennis scene. It is not that India had dearth in talent in the past on the tennis horizon. NEW DELHI, July 24  The Delhi High Court yesterday sought reply from the Board of Control for Cricket in India (BCCI) on a petition seeking to stop sporting the logo of cigarette companies by Indian cricketers during matches saying this had an adverse effect on children. LONDON, July 24  Surrey strengthened their grip on the English County Championship with a crushing innings and 123 runs victory over sixth-placed Warwickshire at Edgbaston yesterday. HONG KONG, July 24  Manchester United supremo Martin Edwards yesterday snubbed an 11th-hour plea by the British Government asking his club to reconsider their decision to withdraw from the FA Cup. LONDON, July 24  British soccer fans have welcomed plans to reform world cup ticket sales, even though it could mean fewer home fans will see the games. PERUGIA (Italy), July 24  Referees halted an exhibition soccer match on Thursday between Libyas national team, which includes a son of Libyan leader Moammar Gadhafi, and an Italian major league team when both sides started brawling. CHENNAI, July 24  An 18-member Indian junior mens hockey team to tour Holland and Poland would be selected at Bangalore on July 27. CALCUTTA, July 24 (UNI)  Indias hopes of grabbing a slot in the Sydney Olympic soccer event went up in smoke when they drew their home match goalless against Thailand in the Asia group nine Pre-Olympic Soccer Tournament at Salt Lake Stadium here today. Despite todays draw Thailand moved into the second round of the pre-Olympic qualifiers by virtue of their 2-0 victory over India in the first leg match played in Bangkok on July 17 last. Things became easier for Thailand after three other teams in Asia group nine  Singapore, Laos and Vietnam  withdrew from the tournament. India, egged on by a vociferous home crowd, had only themselves to blame for their unceremonious exit as their forwards, especially Bijen Singh and A.R. DCunha, wasted easy scoring chances from close. While Thailand preferred to play defensive as a draw was enough to see them through to the next round, the Indians never looked to be going for the kill. A win by a margin of at least three goals was the only way the hosts could have made it to the next round, but that was not to be. They never played an all out game as had been promised by technical director P.K. Banerjee. Though the host deep defence managed to keep their fort intact with custodian Prasanta Dora flinging himself on a couple of occasions to bring off some nice saves, their forwards failed to spell much danger in the Thai prohibitive zone and, in fact, blew away whatever little chance they could present themselves with. Their shabby game notwithstanding, it was India that got the first chance to forge ahead in the sixth minute. But, a shot from the close by striker Bijen Singh reverberated off the left post, much to the dismay of the home supporters. Thailand also forced their chance in the 10th minute. But, an alert Indian custodian Dora brought off two fine saves in tandem off a Thai overlapping move by back Chomchayopon and striker B. Boonprom. India again came near scoring in the 12th minute but the cracker by striker Dipendu Biswas was smartly warded off by rival keeper W. Klaham. Thailand could have gone one up in the 22nd minute but Indian keeper Dora anticipated well to rush out in time to thwart a scoring bid by Thai striker Po-On off other forward Suk Som Jit. Towards the end of first half India showed some initiative again but failed to score. While in the 3rd minute Bijen Singh long ranger was wide off the mark, medio Anthony Wilsons stingy shot was saved by Thai custodian Klaham. A few moments before the breather Bijen Singh missed the easiest opportunity of the day shooting out from close range off a combined move. The second half saw Thailand going more defensive. But India failed to utilise the situation. Alvito DCunha, who came in place of Bijen Singh in the 69th minute, created a fine opportunity moving all on his own after collecting the ball from the centre line and dribbling past a couple of Thai defenders. But, he shot wide after reaching the middle of the box. India managed to score a goal but Shiekh Sanjib, whose header went in, was adjudged offside by the referee. India got another chance to score during the injury time. But medio Rennedy Singh spoiled the chance shooting over. India: Prasanta Dora, Falguni Dutta, Deepak Kumar Mondal, Mahesh Gawli, Suresh Muttath, Roque Barreto (S.K. Sanjib), A.S. Feroz, L. James Singh (Anthony Wilson), Rennedy Singh, Dipendu Biswas and Bijen Singh (A.R.C. DCunha). Thailand: Watcharpong Klaham, Sombut Chomchayapon, Preratat Phorunandee, Sutee Nuleme (Jakapong Hansuwan), Teerasak Po-On, (Thewet Junhom), Nirut Surasiang, Bamrung Boonprom, Pongsak Khongkeaw, Manit Noycagh, Isswa Singtong and Itsaret Pala (Lotsama Wangbudee). ISLAMABAD, July 24 (PTI)  Ehtesab (accountability) Bureau of Pakistan today ordered framing of charges against its cricket captain Wasim Akram and seven others for match-fixing and betting. Akram and his seven teammates were found guilty of the charges in an international inquiry conducted by Pakistan Cricket Board (PCB), it was officially announced here today. The cricketers named by PCB are Salim Malik, Ijaz Ahmed, Moin Khan, Inzamam-ul Haq, Mushtaq Ahmed, Waqar Younis and Saqlain Mushtaq, besides Akram. Ehtesab Bureau, which was looking into the allegations against the Pakistani team for the manner of its defeat in World Cup final, today ordered framing of charges against the cricketers under the conduct rules of the PCB and also asked the one-man judicial commission  looking into the same charges  to expedite its report. Ehtesab will start the official procedure of framing the charges against these players who all were part of the team that played World Cup final against Australia, Ehtesab director general Khalid Aziz said while making the report public. As per the charges framed against Akram and others, they have been accused of deliberately losing matches and were asked to explain as to why the PCB should not ban them for life from playing cricket. The Ehtesab official also said the PCB probe committee had found that there were allegations against these players and had recommended that they should not be included in the national team pending further investigations. But despite these recommendations they played in the World Cup, Ehtesab official remarked in an obvious reference to the affairs of dissolved PCB. There were two specific charges each against Akram and Malik and one combined charge against Akram, Malik and Ijaz Ahmed, according to PCB probe committee report. Akram has been accused of losing a Sharjah Cup match to India in 1994 by providing Indians the opportunity to score runs speedily through intentional bad field placement. The charge also mentions that Akram got angry with Aamir Sohail because he had restrained the Indians and had taken two wickets with field readjustments when he had gone out of field for some time. The other charge is related to a match against New Zealand in 1994 itself. Akram is charged with asking bowler Ata-ur Rehman to bowl badly. For the same match, Malik had been accused of conspiring with Akram and Ijaz Ahmed to make Pakistan lose. In the combined charge against the three players it was alleged that they accompanied known bookies of Sharjah  known as Chautani and Jojo  and conspired to ensure that Pakistan lost the match to India in 1994. The Ehtesab Director General also said the judicial commission has been asked to submit its report into match-fixing (relating to the allegations before the World Cup) immediately. Meanwhile, former skipper Aamir Sohail here alleged that Akram was involved in match-fixing and that he was a close friend of an Indian bookie. The outspoken Sohail deposed before the Ehtasab (accountability) bureau that Akram was one of the main characters for match-fixing in the Pakistan team along with veteran batsmen Salim Malik and Ijaz Ahmed, The Nation daily reported today quoting sources in the bureau. Sohail also promised that he would provide details of properties and assets of these players which are not in keeping with their known sources of income, the paper said. Sohail made these allegations yesterday before the government bureau which is probing allegations that Pakistan players were engaged in objectionable activities during their World Cup campaign in the aftermath of their debacle against Australia in the final. Akram, who is in England, could not be reached for his comments on Sohails allegations. Sohail disclosed the names of the key players who are not only the chummies of the bookie, but are also regular casino visitors when on official tour abroad, the report quoted the bureau sources as saying. LONDON, July 24 (Reuters)  England lost captain Nasser Hussain with a fractured finger as New Zealand pressed for a first-ever victory at the Lords on the third day of the second Test today. By tea England were clinging on at 55 for one in their second innings, still 117 behind. New Zealand, seeking a win to level the four-match series at one-all, had earlier been dismissed soon after lunch for 358, giving them a handsome first innings lead of 172. Hussain was taken to hospital for an x-ray on his right hand after saving a boundary early in the days play and England physiotherapist Wayne Morton said later he had fractured the top joint of his middle finger. Batting conditions were again much easier than on the first day and New Zealand, 242 for six overnight, adopted a positive approach in adding 116 for their last four wickets in 33 overs. Wicketkeeper Adam Parore played on for 12 to Andy Caddick, who had to wait almost until lunch for Englands next success when he bowled Chris Cairns for a lively 31 off 42 balls, including five fours. But the main contributor to New Zealands big lead was left-arm spinner Daniel Vettori who hit seven boundaries in an aggressive 54 and shared in an eighth-wicket partnership of 70 with Cairns. Vettori was soon in action when England batted again, beginning a long spell after pacemen Cairns and Geoff Allott failed to make an early breakthrough. 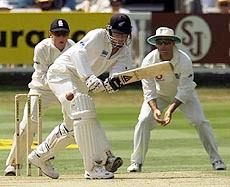 Englands openers were mainly untroubled until the last over before tea when Mark Butcher took a wild swing at Vettori and was well caught by Nathan Astle running back from the slips for 20. Alec Stewart was not out 32 at the interval. Fall of wickets: 1-43, 2-45, 3-112, 4-232, 5-239, 6-242, 7-275, 8-345, 9-351. Bowling: A Mullally 27-7-98-2, A Caddick 34-1-92-3, D Headley 27-7-74-3, P Tufnell 27.1-7-61-2, M Butcher 3-0-7-0, M Ramprakash 1-0-1-0. WINNIPEG, July 24 (AP)  Canadas gold-medal winning women came back for more yesterday as the host country claimed another two canoe-kayak victories on Lake Minnesdosa and continued their strong showing on the first official day of the 13th Pan American Games. Karen Furneaux, Marie-Josee Gibeau-Ouimet and Carrie Lightbound, who rowed with Liza Racine in the womens 500-metre kayak fours to give Canada one of their two golds on Thursday, returned to the water to add to Canadas honours. Furneaux won the womens 500-metre kayak singles event by less than a second over American Kathryn Colin, and Gibeau-Ouimet and Lightbound again joined to beat Colin and Tamara Jenkins in the 500-metre kayak doubles, winning their race by less than a half second. There was a tear in my eyes as I crossed the finish line because it was setting in what I had done, Furneaux said. Canada also claimed a pair of silver medals in canoeing and kayaking on Friday, giving the country four gold, three silver and a bronze in 12 races. That beats their 1995 showing in Mardel Plata, Argentina, when they won two gold, four silver and one bronze in canoeing-kayaking. But this years competition was weak, with no qualifying heats and some finals featuring just five entries. I think its going to be a real positive boost for the team and Canada to do well at these Pan Am Games, she said. Hopefully they can follow what weve done so far and give them some encouragement. Furneaux said. The regional Olympics for the Americas were to get their formal start last night with the opening ceremony. That ceremony was not without some controversy. A group of about 200 aboriginal Canadians demonstrated outside Winnipeg Stadium, the site of the opening ceremony, after an 11-kilometre march, to protest what they say are third-world conditions for native people in the Canadian province of Manitoba. The protesters promised to remain outside Winnipeg Stadium and not disrupt the official opening of the games, which was to be attended by Princess Anne and other dignitaries. Besides the canoeing-kayaking, yesterdays action also saw the start of the soccer, volleyball and water polo tournaments. The USA opened the mens soccer competition with a 1-0 victory over Cuba, winning on Peter Vagenas 57th-minute goal. Jamaica toppled Uruguay, the only South American nation competing in the mens soccer tournament 1-0. In womens soccer, which made its debut yesterday, Trinidad and Tobago routed Canada 7-1 the Americans clobbered Costa Rica 6-0. Mens and womens water polos first day was marked by a pair of routs by the Americans. The US men thrashed Colombia 18-0 and the women overwhelmed Puerto Rico 16-2. NEW DELHI, July 24 (PTI)  A new penalty corner routine, brought in as trial rule by the Federation International de Hockey (FIH) and aimed at more open play could help India overcome their perennial weakness in such set-piece conversions. Incorporated as trial rule in April, 1998, and likely to be adopted soon, it requires attacking players to position themselves five yards away from top of the circle  21 yards from the goalline  and move in to intercept the penalty corner push only when the ball travels out of the circle. Gian Singh, veteran coach and renowned rules expert told PTI that Indian coaches and officials should immediately start working on the new system, aimed at open play and more goals. On Indias poor rate of penalty corner conversion  only one of 17 awards was converted in the 1996 Atlanta Olympics and two out of 22 at the 1997 Chennai Champions Trophy  Gian Singh said a penalty corner competition should be introduced at every tournament from the local to the national level to overcome this weakness. Once the preliminary rounds of a tournament are over and only top teams are left, there should be separate penalty corner competition at the end of each match with prize money for the winners as the right incentive, Gian Singh, an authority in interpreting rule changes, said. To improve rate of penalty corner conversion, specific training should be imparted to develop the three key aspects  pushing, stopping and hitting  he said. Gian Singh, Chairman of the Indian Hockey Federations coaching advisory committee, said the best way to hone penalty corner skills was to practice the push in pairs, standing 16 yards apart, for long spells. The biggest flaw in hitting was lifting the stick too high which gives rival defenders just that extra moment to rush out and cover the angle. Our players should learn to hit without raising the stick too much, he said, adding that pushing, stopping and hitting can be practised in pairs. Our own players defending penalty corners are too slow rushing out of the goal-line which enables opponents, Europeans in particular, to successfully convert, he said. Gian Singh said penalty corner competition at all levels must be introduced at the earliest if Indian players are to fine-tune their approach. Once the top six sides are spotted, the competition should be held at the end of each match. This would also bring more crowds to watch the matches, he added. With the new penalty corner routine likely to be enforced around the 2000 Sydney Olympics, Indian players would be able to breathe easy as their weakness in stopping and hitting would automatically fail to matter. But alongside competition on the present penalty corner routine, one based on the trial version should also be introduced to ensure that no new weakness developed when it is enforced by the FIH, he said. India should systematically introduce trial rules brought in by the FIH in domestic competitions to ensure that the national team was not at a disadvantage in international tournaments, Gian Singh said. The idea behind the effort to introduce the new penalty corner routine was to slow down the routine and ensure more open play. It also helps umpires watch the sequence better as they are under great pressure in the present system. It will also be more spectator-friendly, he said. Penalty corner routine has come a long way since it was introduced in 1908. Till 1981, the ball was stopped inside the circle by hand. Between 1982 and 1992, the push had to be stopped with the stick inside the circle and then on the stopping was to be done outside the circle. CHANDIGARH, July 24  The recent grand slam victories in mens doubles event by Indias Leander Paes and Mahesh Bhupathy may go a long way in inspiring the younger lot in India for, it has set a new trend in the Indian tennis scene. It is not that India had dearth in talent in the past on the tennis horizon. In fact if you go by their talent and record, players then were much more talented than both Leander and Mahesh; their records speak for themselves. You may start with Indias Ramanathan Krishnan, the touch artist from India who reached Wimbledons semifinals once in his brilliant career. Though equipped with a soft service by todays standards, Ramanathan possessed great groundstrokes that found him in the last four of the worlds premier tournament in England. Then came the Vijay Amrithraj-Anand Amrithraj duo who too dominated the Indian scene besides making its mark on the tennis world. Vijay Amrithraj, a serve-and-volley player as he was, entered the quarterfinals of the Wimbledon tournament. In one such attempt he failed emulating Ramanathan when leading 2-1 he went down fighting to Jimmy Connors of the USA, the ultimate winner, in the quarterfinal match. An easy shot had cost him the semifinal slot. Vijay had netted a volley when he could have earned a set point in the encounter with Connors. But that was not to. Vijay also reached the last eight of the US open once. Side by side the two Vijay and Anand also played doubles yet never reached the heights Leander and Mahesh have reached. Once Anand faded away. Vijay lost interest in doubles and concentrated on singles. Similarly, Ramesh, the son of the Ramanathan family, rose to be rated as high as 27th on the ATP list in his career. He had many memorable victories on great players in his career. Yet somehow, he, like his father Ramanathan, did not draw himself towards the doubles. Similarly, Shashi Menon and Jasjit Singh had also chalked out many important victories in their respective careers, but did not pay much attention to doubles event. But it went to the credit of Leander and Mahesh to give respectability to the doubles event by achieving what others had failed to do. True, Maheshs singles record is dismal, Leander is of course far better having broken into the top 100 bracket once when he earned the important scalp of until now world no 1 Pete Sampras of USA. It is also to their credit that despite suffering reverses, the two continued trying their luck in the mens doubles event. Their grit and determination, and perseverance paid and they inched their way up the ATP doubles ladder. In the past four attempts, they had reached semifinals of the doubles event in the grand slam tournaments but had somehow failed to break the jinx. But 1999 brought new hopes for the pair who together not only won the mens doubles event in the most authoritative manner but to provide icing on the cake, Leander in partnership Lisa Reymond won the mixed doubles title at the Wimbledon99, two titles on the same day. Earlier, the two had won the French Open mens doubles event in May this year. So these two grand slam titles for Leander and Mahesh with a mixed doubles title under their belt  the latter had also won the mixed doubles title at the French Open with a Japanese player a few years ago  all this makes a nice reading. We also want to dispel an oft-repeated view among the Indians. If you cant fare well in singles does not mean you would reach that far in doubles. Top players had tried their hand in the doubles, but have not succeeded. If you are on top in singles does not guarantee you will be on top in doubles too. For instance, Leander and Mahesh beat Sampras and Tim Henmen in a tournament, otherwise individually, the Indians were no match to both Sampras and Henmen. The All-India Tennis Association (AITA) is organising the National Grass Court and Hard Court Tennis Championships, besides challengers. Though singles and doubles are played simultaneously, yet AITA should start an exclusive all-India doubles tennis tournament for both girls and boys, just to put more emphasis on the doubles and the move may produce good doubles pairs. A fine doubles pair is a great asset. In recent times we have seen that countries try to engage specialist pairs in Davis Cup matches sinks the victory hinges on the doubles success. So it is very essential to have specialist doubles pairs. Similarly, AITA can direct their affiliates in the states to conduct doubles event tournaments because keen competition may throw fresh talent in doubles. Doubles normally plays a second fiddle to the singles event but victories have stressed we may lay more stress on doubles. We must follow a path shown by Leander and Mahesh. Indias talent in the doubles had remained unharnessed so far, it is time that we give proper recognition to the event so that India possesses fine specialist pairs who may not only serve India in the Davis Cup but also carve out a place for themselves in the grand slam tournaments. For, we are convinced that Leander and Maheshs exploits are enough to inspire the younger lot who may try to emulate their new tennis heroes in this event. NEW DELHI, July 24 (PTI)  The Delhi High Court yesterday sought reply from the Board of Control for Cricket in India (BCCI) on a petition seeking to stop sporting the logo of cigarette companies by Indian cricketers during matches saying this had an adverse effect on children. A Division bench of Mr Justice Arun Kumar and Mr Justice D K Jain while issuing notice to the BCCI asked the board to file its reply by September 16, the next date of hearing. The notice to BCCI was issued after government counsel Rakesh Tiku submitted that it had no control over the players. The court had issued notices earlier to the Union Government, Information and Broadcasting Ministry and Director General of Doordarshan (DD). The public interest litigation (PIL) filed by the voluntary Health Association of India (VHAI) said that sports related advertisements of cigarette were rapidly growing and these had potential to lure children to smoking. The PIL moved through advocate Prashant Bhushan sought to direct the BCCI to immediately cancel all its contracts with the Indian Tobacco Company (ITC) alleging that the players were popularising the companys Wills brand during matches covered live by DD. Seeking to stop the cricketers from displaying the Wills logo the petition said the players should be prohibited from entering into sponsorship programme with any cigarette manufacturer to popularise their products. The VHAI said cricket, which had attained great popularity, had turned into a scourge of millions of children and any advertisement about cigarette and tobacco products would definitely have an adverse effect on them. It is no wonder that the last international Cricket World Cup organised in the Indian subcontinent was sponsored by the ITC, the leading cigarette company of India, the petition said adding that the BCCI had entered into a sponsorship contract with the ITC, under which Indian cricket team was sponsored by Wills in all the international matches played abroad. The contract provides that all the players have to wear the Wills logo to create television advertisements and make other promotional and publicity material, it said. Besides the ITC Godfrey Phillips (makers of Four Square brand) had also entered into individual contract with Indian cricket players, as a result, they were unabashedly displaying the logo of Four Square as well, the petition said. LONDON, July 24 (Reuters)  Surrey strengthened their grip on the English County Championship with a crushing innings and 123 runs victory over sixth-placed Warwickshire at Edgbaston yesterday. The unbeaten leaders wrapped up their eighth win of the season with more than a day to spare after skittling the hosts for just 133 in their second innings. Following on 256 behind, Warwickshire reached 55 for one without undue alarm before capitulating against the combined spin attack of Saqlain Mushtaq (five for 32) and Ian Salisbury (four for 46). The Pakistani off-spinner has now taken 26 wickets in Surreys last three games. Sussex celebrated their first triumph at Derby for 44 years after Jason Lewry took a career-best seven for 38 to clinch an 85-run victory over Derbyshire. Durham continued to climb the table with an emphatic innings and 127 runs triumph over Gloucestershire at Cheltenham. Gloucestershire lost their last five first innings wickets for 54 to follow-on 350 runs behind before being dismissed second time around for 223. Kent continued their winning streak with an 88-run victory over Nottinghamshire at Trent Bridge. Julian Thompson, a qualified doctor, took six for 63 to help dismiss Nottinghamshire for 237 after they were reeling at 66 for six. A magnificent rearguard action by fourth-placed Yorkshire averted a shock defeat against bottom of the table Northamptonshire at Scarborough. Yorkshire resumed the final day on 141 for four in their second innings, still trailing by 87. But Australian Test batsman Greg Blewett, 54 not out overnight, reached a match-saving 190 off 316 balls, which included two sixes and 27 fours. Gavin Hamilton provided solid support with an unbeaten 84 before Yorkshire were finally dismissed for 467, giving them an unassailable lead of 239. HONG KONG, July 24 (AFP)  Manchester United supremo Martin Edwards yesterday snubbed an 11th-hour plea by the British Government asking his club to reconsider their decision to withdraw from the FA Cup. Edwards, speaking at a press conference as the Red Devils prepare for the final match of their tour of Australia and the Far East, said there was no way the team would play in the competition  and said he was sick to death of being asked about the thorny issue. Manchester United, the current FA Cup holders, infuriated fans after announcing they were pulling out of next season competition to compete in the inaugural World Club Championship in Brazil in January. The treble-winners say they only withdrew from the FA Cup after pressure from the government, who said playing in World Club championship would help Englands 2006 world cup bid. But on Thursday government officials appealed to United and the English Football Association to try and find a way round the fixture logjam. Lord McIntosh of Haringey, who speaks for the Department of Culture, Media and Sport in the Lords, the upper house of the British Parliament, said he hoped the club could compete in both the cup as well as the World Club Championship in Brazil. Even at this late stage, we hope that a way can be found to achieve this, he said in a Lords written answer. But Edwards remained adamant today Manchester United would not be taking part in the FA Cup next season. Its all right standing up in the House of Lords or the Houses of Parliament saying this and saying that, but theyre not aware of the demands on the club or the demands on the players and what they are capable of playing, Edwards said. Last season we played 62 games and weve got 61 this year. When we sat down and looked at it we realised something had to give. If we play in the FA Cup we could be looking at 70 odd games and theres no way that is feasible, he said. Were very disappointed not to be playing in the tournament. Weve won the FA Cup four times in the last 10 years but the fact is it is not as important to us as the league, and we can hardly withdraw from that (the league). Edwards also again ruled out any chance of Manchester United fielding a youth team in the FA Cup while the squad is in Brazil. Manchester United arrived in Hong Kong last night minus stars Ryan Giggs and Ole Gunnar Solskjaer, who both picked up knocks during Wednesdays match against Shanghai Shenhua. David Beckham, Roy Keane, Gary Neville and Paul Scholes had already been ruled out of the tour along with manager Alex Ferguson. LONDON, July 24 (AFP)  British soccer fans have welcomed plans to reform world cup ticket sales, even though it could mean fewer home fans will see the games. The European Union is eager to avoid any repeat of the France 98 ticket fiasco when the games premier tournament returns to Europe. The European Commission will insist that in future tickets are made available to all members of the continents public instead of just supporters from the home nation. Alison Pilling of the Football Supporters Association is convinced the plan will improve ticket distribution and wont necessarily mean a snub for British fans. If England stages the World Cup in 2006 and all tickets are equally available I still think the home nation will still buy up the majority of them, especially in a nation of football-lovers like ours. Its about having a fair crack of the whip, she said yesterday. Equal access for tickets means fans from all European member states will be able to buy them, but Pilling believes most will still go to fans in host country because they dont have to travel and their team has automatic qualification. The EU this week fined organisers of France 98 a minimal $ 1,050 for their controversial ticket policy, and the commission are likely to come down harder in future if tournament organisers break the new guidelines. The English Football Association is not worried about the impact of the new European Union ticket proposals on domestic showpieces like the FA Cup. The EU Commission has decided everyone should have equal access to tickets for major sporting events in Europe after the debacle of France 98  when thousands of fans outside the host nation were denied tickets. Strictly speaking, this would allow anyone from a European member state to apply for tickets on general sale for the FA Cup final, a five-nations rugby international or Wimbledon. On the other hand, British sports fans would have a better chance to see the French Open tennis or an Italian Cup final. The FA were not unduly concerned, however, about the impact on the FA Cup final, although they stressed crowd segregation remained a key issue. Spokesman Steve Double said: We certainly dont believe this would affect a domestic competition like the FA Cup. PERUGIA (Italy), July 24 (AP)  Referees halted an exhibition soccer match on Thursday between Libyas national team, which includes a son of Libyan leader Moammar Gadhafi, and an Italian major league team when both sides started brawling. Players on the field as well as comrades on the benches joined in the fighting between the north African countrys squad and Serie A team Perugia. Italian state TV showed players shoving and chasing each other around on the field and throwing punches. One Libyan player waved a Libyan flag as he ran after opponents. The match was stopped 17 minutes into play. The TV coverage showed at least one player being carried to an ambulance. The Italian news agency ANSA quoted Libyan officials as saying two Libyan players suffered broken cheekbones. ANSA also reported that, as a precaution, security officials escorted Gadhafis son, Al-Saadi Gadhafi, out of the stadium in Norcia, a town near Perugia. It was not clear if the Libyan leaders son was involved in the brawling. The brawling started after a Perugia striker converted a penalty kick awarded for a foul, and then, a few seconds later, another Libyan defender committed a foul. Libya in the last few years is getting back into sports after Gadhafi, in the early 1980s, banned all sports contests, especially soccer. He said then that soccer only allowed 22 persons to play, while everyone should be allowed to join any game. CHENNAI, July 24 (PTI)  An 18-member Indian junior mens hockey team to tour Holland and Poland would be selected at Bangalore on July 27. About 45 probables are already attending a camp at the SAI Centre, Bangalore, under coach C.R. Kumar. The Indian Hockey Federation (IHF) has decided to pick players in the under-20 age group through they are to play against under-21 teams in these two countries. IHF secretary K Jyothikumaran told PTI this was being done as the junior team was to play in Junior World Cup qualifying tournament next year and the Indian squad members would be well within the rules of age limitation of 21 years when the tournament proper would be held in 2001 at a venue to be announced later. The team on its tour to the Netherlands would play one match against England and three ties against Holland from August 10 to 16. In Poland, the Indians would participate in an eight-nation tournament from August 23 to 29. WHITE PLAINS (New York), July 24 (Reuters)  The top 104 women in the WTA tour singles rankings have entered the 1999 US Open, Tournament Director Jay Snyder announced yesterday. Leading the list of entries for the seasons final grand slam event, which starts August 30 at the National Tennis Centre, is world number one Lindsay Davenport. MUMBAI, July 24 (PTI)  Indian skipper Mohammed Azharuddin returned home unnoticed last night from London after undergoing a shoulder operation there soon after leading India in their unsuccessful campaign to regain the World Cup. However, the veteran player was unavailable for comments about his fitness for the August 22 to 31 one-day tri-series in Sri Lanka which will be Indias first campaign after the World Cup. Azharuddin, who has led the national team for most of the 90s barring the 17-month period from August 1996 to December 1997 when Sachin Tendulkar was the captain, has to wait till July 28 to see whether he retains his job. At the moment there are strong indications that Sachin Tendulkar will don the mantle for his second stint on the hot seat of Indian cricket. AMRITSAR, July 24 (UNI)  National hockey chief coach V J Bhaskaran is working on building physical endurance of the players besides penalty corner conversion at the hockey camp here to select team for Sydney Olympics. Bhaskaran, who refused to be drawn into controversy of exclusion of talented Dhanraj Pillay from list of probables, expressed confidence that the present bunch had a lot of talent. Though it is too early to access Indias chances in Sydney but I have confidence in the boys, he said while pointing out that the average age of the probables attending the camp was 23. CHAMBA, July 24  Jalpa Club beat Bangotu Club by the four wickets in the semifinal of the Minjar Fair Cricket Tournament. Bangotu Club won the toss and elected to bat. Amit and Manu played well to give them a good start. Amit remained not out on 67 as Bangotu Club made 136 for five in 30 overs. In reply Jalpa Club scored 137 for 6. Sachin, a national junior player, scored 45 not out. Brief scores. Bangotu Club 136 for 5 (Amit not out 67, Manu 30; Sanjay 2 for 14, Pankaj 1 for 15). Jalpa Club  137 for 6 (Sachin 45 no, Sadik 40; Anil 2 for 17, Yogesh 1 for 16, Kursid 1 for 17). LUDHIANA, July 24  Kundan Vidya Mandir School (KVM) in the boys section and Sacred Heart Senior Secondary School, Bhai Randhir Singh Nagar, in the girls section clinched titles in the eighth Sahodhya Schools Complex Table Tennis Tournament which concluded at KVM School here today. KVM players quelled a strong challenge put up by Sacred Heart Senior Secondary School, Sarabha Nagar, winning 3-2. National ranked player and current Punjab champion, Disney, of Sacred Heart School gave a 2-0 lead to his team after winning both his matches comprehensively. He defeated Gaurav Uppal 21-13, 21-13 and then outplayed Harminder Singh 21-17, 21-17. But Ashish then lost to Harminder Singh 8-21, 10-21 and went down 12-21, 15-21 to Gaurav Uppal. In the deciding match, Nimit of KVM School prevailed over Karan Sood 12-21, 23-21, 21-13 to clinch the title for his school. In the girls section, Sacred Heart caused a flutter when they dethroned current champions KVM School. Sisters Harleen Kaur and Jasleen, won their matches comfortably to annex the title with an easy 2-0 victory. (Girls): Final-Sacred Heart Sr Sec School (BRS Nagar) KVM 2-0 (Harleen Kaur b Anchal 21-14, 21-13; Jasleen Kaur b Kinori 21-14, 21-10). 3rd Gobindgarh Public School b Tagore Public School 2-0 (Megha b Mandeep Kaur 21-17, 21-11; Rajul b Damanpreet Kaur 12-21, 21-16, 21-17). Boys: Semifinals: Sacred Heart Convent Sr Sec School (Sarabha Nagar) b Alpine Int School 3-1 (Omkar b Raghav 21-11, 21-10; Disney b Rubal 21-15, 21-18; Karan b Atul 21-18, 21-11; Disney b Omkar 21-10, 21-15). 3rd Alpine International School b G.G.N. Public School 3-1 ( Onkar b pushpinder Singh 21-19, 21-18; Rubal b Guneet Singh 21-14 21-15; Atul lost to Amrinder 15-21, 21-23; Rubal b Pushpinder 21-9, 21-15). (Final): Kundan Vidya Mandir b Sacred Heart Convent Sr Sec School 3-2 ( Gaurav lost to Disney 13-21, 13-21; Harminder b Ashish 21-8, 21-10; Nimit b Karan 12-21, 23-21, 21-13, Dharminder lost to Disney 17-21, 17-21; Gaurav b Ashish 21-12, 21-15). CHANDIGARH, July 24  Arjuna Awardee A Maria Irudayam, two-time world champion and national champion for nine times, will be among the top-eight players of the country who will take part in the Carrom Masters Championship to be held at Jalandhar on July 26 and 27. The championship, organised by the All-India Carrom Federation in association,with the Punjab State Carrom Association, will see the internationals clashing for the Masters Title. PATIALA July 24  Favourites PSEB posted a narrow 87-70 victory over fancied ONGC in the sixth Baldev Memorial Basketball Tournament being played at the Polo Grounds here today. RCF, Kapurthala, prevailed upon local outfit Young Cagers Club (YCC) 52-39 and SCR, Secunderabad, derailed DLW, Varanasi, 79-57. Punjab Police, playing its second match in a day, drubbed ONGC 80-37. Results BSF bt DLW, Varanasi 68-38; SCR, Secunderabad bt PSEB 69-52; SCR, Secunderabad bt DLW, Varanasi 79-57. Womens section Gurdaspur bt Rest of Punjab 37-19; Ludhiana bt Gurdaspur 53-30.